Printed drink bottles are one of the most common items to give out as promotional gifts. People carry drinking bottles to the gym, to work, in their car, to a game, etc. Some people even keep their own drinking bottle on them at all times for hydration purposes. Our range of promotional drink bottles are made only from BPA free materials and are tried and test by sports teams, organisations and individuals all over Australia! Reusable plastic drinking bottles are used by many people, for many different reasons. So it’s no surprise that these drinking bottles are a popular item. These bottles have also been used as a thank you gift to new account holders at banks and/or stores. 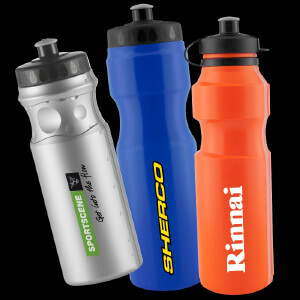 Although our drinking bottles are popular for many different reasons, they are predominantly used for sports teams or businesses, companies and events that are athletically inclined. All of the plastic drinking bottles we offer are customisable. So you can have your team name, company name, or business name printed on them. Whenever someone takes a sip from their drinking bottle they will be representing their team or promoting your businesses name. They are a great gift that people are sure to use, and they are also great promotional items. These plastic bottles come in a wide range of vibrant colours, so they are sure to make your team name or company stand out. Although they are great for teams and for promotional reasons, they can also be used to raise money. They can be sold at a slightly more expensive price then they were bought at an event that is being held to raise money for a specific cause. All of the proceeds from selling the bottles can be put towards the cause you are raising money for. You can also have a special message printed on the bottles. Usually people are more likely to purchase a bottle if the money they spend is going to a good cause. We offer over 20 different bottles for you to choose from in various different styles and designs. So we are sure to have something that will fit your needs perfectly. We have custom drinking bottles that are more traditional, like our 750ML standard bottles. We also have drinking bottles that are a little more unique, and are sure to capture the public’s attention. Such as the Binx Mason Jar bottle, and the bobble bottle. Our Atlanta Eco Safe bottles are great for people that are in a more corporate, sophisticated position. All of our bottles have been tried and tested by organisations and sports teams from various walks of life. You can be sure that you are getting products that not only look great, but work great as well. Are you thinking about purchasing some of these drinking bottles for your event, but are not sure if you have enough time now? Don’t worry. We also offer a rush delivery service for people that are trying to pull some last minute strings for their event. We can deliver your order in as little as five days, but conditions may apply.